Build your documentation skills.and your confidence. 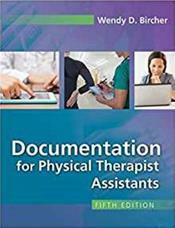 Step by step, this text/workbook introduces you to the importance of documentation; shows you how to develop and write a proper and defensible note; and prepares you to meet the technological challenges you'll encounter in practice. You'll learn how to provide the proper documentation to assure all forms of reimbursement (including third party) for your services. You'll also explore issues of patient confidentiality, HIPAA requirements, and the ever-increasing demands of legal and ethical practice in a litigious society. Purchase this title NEW and get FREE access to the eBook, your complete text online with searching, highlighting, and bookmarking functionality.